As a public school, Barnstable High School represents a notably diverse community, with students of all backgrounds and skill sets. Among this inclusive school environment, there is evident effort to incorporate opportunities for students to collaborate and learn together. A prime example of inclusion within Barnstable High School are the opportunities made to integrate and prepare students of disabilities. The Community Based Transitions Program provides basic services for students between the ages of 18 and 22 on individualized education plans to help them develop life skills necessary in the adult world. According to Christine Spence, who is largely in charge of the program within the school, “the program is designed to teach functional academics, life skills, social thinking and entry-level work skills to support a student’s growth into adulthood.” Some of these skills include daily living skills (laundry, prepare meals, etc. ), access and use public transportation, develop appropriate social behavior, money management, and technology. Part of the program within school setting involves different simulated work environments to help students practice their skills. “Throughout the course of the day you might see Transitions students working in the Coppee Shop selling coffee to staff, waters, snacks and clothing to students,” said Spence. Soon, the Coppee Shop will also be selling Butler’s Sporting Goods apparel, which will teach students marketing skills as well.“You might pass by our hallway and smell our famous cookies baking,” added Spence. In addition to in school involvement, students in the program also run their own Copy Center and stock vending machines. Outside of school, the students may be helping out with Meals-on-Wheels, working at the Town Clerk’s Office, or at the Main Street Business Improvement District. After high school, students following the program are linked with different resources throughout the community to find a pathway for each student. “Helping them get connected to the right resources from the time they enter to when they leave is probably the most important part of our job,” said Spence. “Our students are very hard workers and enjoy coming to school to learn. Just like you, they enjoy being social and having fun,” said Spence. 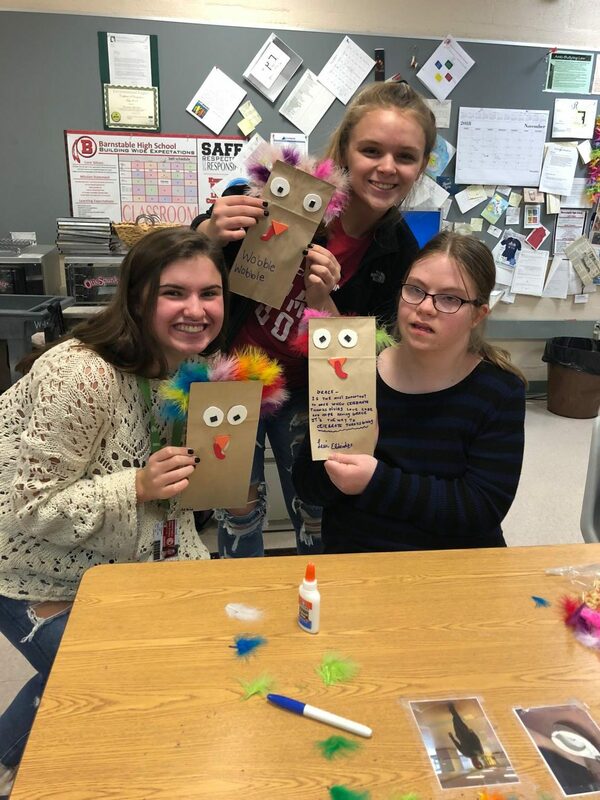 Best Buddies Club strives to connect special education students and other BHS students in an integrated group of fun, partner activities. The club is dedicated to “creating friendships with students you may not normally see throughout the day,” says junior Caroline Floren, Best Buddies Secretary. “Best Buddies is a place where you forget labels, you forget levels, and you forget all worries except how hard it hurts to laugh. We just want to provide a space of friendly fun for all students of BHS,” said Best Buddies President and senior Skylar Bowman. When after school clubs may not be an option to some student, integrated classes have given students the opportunity to work together with students of disabilities in electives like art and gym. “I have family members with various disabilities,so when it came time to take an art class, this seemed like something I’d enjoy,” says sophomore Maggie Pronovost on choosing to take integrated art. The goal of integrated classes such as these are to pair mainstream students and students with disability to learn together in a welcoming environment,where students get to learn and understand each other. The students that take the class represent a variety of different forms of disabilities. This results in different struggles and skills amongst the students that mainstream students attempt to help improve and work on. It is a learning experience for both groups of students.